Imani-Baran, A., Yakhchali, M., Malekzadeh Viayeh, R., Farhangpajuh, F. (2011). Prevalence of Cercariae Infection in Lymnaea auricularia (Linnaeus, 1758) in NorthWest of Iran. 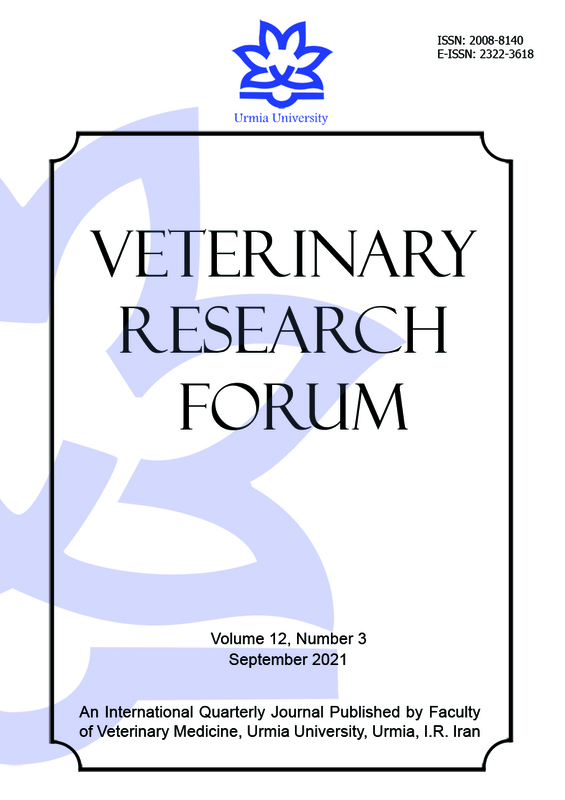 Veterinary Research Forum, 2(2), 121-127. Abbas Imani-Baran; Mohammad Yakhchali; Reza Malekzadeh Viayeh; Farhad Farhangpajuh. "Prevalence of Cercariae Infection in Lymnaea auricularia (Linnaeus, 1758) in NorthWest of Iran". Veterinary Research Forum, 2, 2, 2011, 121-127. Imani-Baran, A., Yakhchali, M., Malekzadeh Viayeh, R., Farhangpajuh, F. (2011). 'Prevalence of Cercariae Infection in Lymnaea auricularia (Linnaeus, 1758) in NorthWest of Iran', Veterinary Research Forum, 2(2), pp. 121-127. Imani-Baran, A., Yakhchali, M., Malekzadeh Viayeh, R., Farhangpajuh, F. Prevalence of Cercariae Infection in Lymnaea auricularia (Linnaeus, 1758) in NorthWest of Iran. Veterinary Research Forum, 2011; 2(2): 121-127. The pond snail Lymnaea auricularia serves as an intermediate host for many digenian species. In West Azerbaijan province, northwestern Iran, the cercariae infection investigation was undertaken in L. auricularia from May to November 2010. Of 6759 collected Lymnaeid snails, 370(5.5%) L. auricularia snails were identified. Cercariae infection was found in a number of 276 (74.56 %) snails. The results showed that removed cercariae from L. auricularia belonged to Echinostomcercariae (96.38 %) and Furcocercariae (3.62 %) which were found in two out of 28 sites during the course of study. In summer and fall, the highest prevalence of cercariae infection was recorded for both identified cercariae. It is concluded that L. auricularia could be an important intermediate host of large group digenian trematodes in the region, which is necessary to take consideration in the control program of trematode infection.